Asturix is not just another Ubuntu based GNU/Linux distribution. 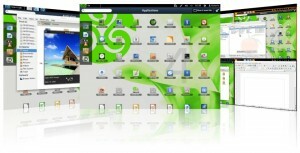 Because it features a heavily customized Gnome 3 (also known as Shell) desktop by the Asturix developers thus it’s a unique desktop of their own!. Update: As you can see from the below comment from Ricardo (a developer), This is not a Gnome Shell desktop, in fact it’s a totally new desktop environment of their own called Asturix on! (created by a 16 year-old & the Asturix project core developer called Luis Iván Cuende). It’s a desktop that’s designed using web based technologies (such as HTML 5 etc, as a “future proof” I suppose) and integrated with the introduction of Asturix 4 to run as a normal desktop environment (just like Unity, Gnome Shell etc). And after seeing the video I too felt like the Asturix customized Gnome Shell has a touch of Ubuntu Unity (with a left-side application launcher) plus the Gnome Shell desktop that has few things in common with the old and awesome Gnome Classic desktop (with the ability to minimize to its top panel etc). It’s actually sort of a “3 in 1 desktop” ;-). It comes with a lot applications by default and proprietary codecs installed as well. Uses the VLC as the default multimedia player and Clementine as the audio player. Other software includes GIMP (raster image editor) with over 5000 color palettes (which is the largest collection of colors in an OS according to the developers! ), Brasero optical disk burner, LibreOffice as the office productivity suite, Chromium as the default web browser, integrated support for Twitter/Facebook/Jamendo/Google Docs, few built in themes etc are just a few to mention. If you want to get a more clear idea (before downloading ;-)) then have a look at the below official Asturix 4 release video. Although to be honest the default “search” window can be a bit of a distraction at times and I hope that there’s a feature so we can disable it. Anyhow, for a distribution that uses a somewhat “heavily” customized Gnome Shell desktop (“Asturix on”) but behaves a bit like Classic Gnome and Unity … perhaps if you have time Asturix GNU/Linux might be worth trying (follow this link to get it). Oh well, I’ll leave the final judgment to you as a safety precaution ;-). Good luck. Asturix dont use a customized Gnome Shell. That you see is Asturix On, not Gnome Shell. Asturix On is a Asturix-made desktop that is not based in Gnome Shell. Thanks Ricardo, the eyes fooled me :). I updated the post.